Stories are still being told about the Trojan War. There have been many fine poems, plays and novels written on Troy themes throughout the twentieth century, including Ulysses, James Joyce's novel of Odysseus as a Jew wandering through Dublin, The Flies, Jean-Paul Sartre's update of the Orestes story, and Omeros, Derek Walcott's Caribbean Odyssey epic. There are also wonderful films made on Trojan themes, including two based on plays by Euripides: The Trojan Women and Iphigenia. Many of these books may be hard to find, so I suggest referring to the list of Online Booksellers if you can't find them locally. I have bought many of these books online, and some of them used. Agamemnon: a modernized version by Charles Mee. "Arms and the Boy": a poem by Wilfred Owen reflecting the opening of the Aeneid in a WWI setting. "Helen of Troy": a poem by Sara Teasdale. Annoying ads, but scroll down to the poem. Orestes: a modernized version by Charles Mee. "Menelaus and Helen": a poem by Rupert Brooke, imagining the aging royal couple back home after the Trojan War. The Shield of Achilles": a poem by W. H. Auden. A modern vision of the famous shield, showing scenes of chaos and injustice (where the traditional shield had shown scenes of order and justice). The Trojan Women: A Love Story: a modernized version by Charles Mee. Troy: The Movie: by John M. Ford; witty long poem about Troy from the perspective of a Hollywood filmmaker. Ulysses by James Joyce: includes a full online text, summaries, study guides, message boards and more. An attractive, easy to use site. Harry Potter and the Classical World; a blog comparing Harry Potter and the Iliad especially; interesting. Homer's Iliad: The poem of power; reflections on the modern relevance of the Iliad. Iphigenia and Other Daughters: a lively, detailed review of a modern play by Ellen McLaughlin that combines parts of the two Iphigenia plays with pieces from other Greek tragedies. The Iliad and what it can still tell us about war. An essay in The Guardian by Charlotte Higgins. Modern American Poetry: Louise Gluck. Includes a set of reviews of Meadowlands, her version of the Odyssey. Review of Achilles in Vietnam: The book being reviewed is by a psychiatrist who compares insights from Homer's Iliad to traumatic experiences of soldiers in Vietnam. "The Trojan War: Helen and the Weapons of Mass Destructon." An essay by William Harris. Lusus Troiae: The Troy Game. An equestrian event held in ancient Rome. The Troy Game: A Wikipedia article on Sara Douglass' four volume fantasy series The Troy Game. Iliad: A card game about the Trojan War. Nintendo's "Trojan": A game that includes Trojan Warriors as well as Killer Piranhas! Troia: A new board game about the archaeology of Troy. The Trojan War Board Game: a boxed set. "24-Hour War: Is Christopher Logue a genius or a madman?" A review of All Day Permanent Red, Christopher Logue's retelling of part of the story of the Iliad in contemporary idiom. On Slate. Scroll down and/or wait a bit to see review. Ulysses by James Joyce. "This is a hypertextual self referential edition of Ulysses....The text was prepared using the Project Gutenberg edition." The Song of Achilles. Madeline Miller. A NYTimes Review of the book, which is a highly readable, intelligent and Homerically sound retelling of the story of Achilles from boyhood until his death and a bit after. The narrator is Patroclus, his beloved friend and lover. Agamemnon Films: A film company that roots itself in Aristotle and Greek drama. "Boy Troy": a thorough, thoughtful, generally positive review by Shari Rosenblum of the film Troy (2004). Dancing to the Continuing Relevance of the Trojan War; an essay about a performance of a modern dance rooted in Greek stories of Cassandra, Iphigenia and Helen by RIOULT NY troupe. King Priam: (1962) by Michael Tippett. Based largely on the Iliad. This page is a review the opera DVD by David Tuttle. Helen of Troy: The rather dated 1955 film is described on the Internet Movie Data Base. Hercules: Disney's 1998 animated film; made for TV, and now available as a video. The page reference is on the Internet Movie Data Base, a great place to find old Troy movies. "No gods or gay men but a whole lot of llamas." by Alex von Tunzelmann. He clearly did not love the movie Troy with Brad Pitt. The Trojan Women: IMDB information about the excellent 1971 film version of Euripides' drama. Troy: May, 2004 blockbuster with Brad Pitt, described on IMDB. "Troy's Fallen": an essay (with images) about how the real Troy compares to various film and tv versions. Published in Archaeology, May 14, 2004. "Achilles Last Stand": Lyrics to a Led Zeppelin song. "Temporary Like Achilles": Lyrics to a Bob Dylan song. Greek Place Names in U.S. Cities. Two problems if you want to use this for an Activity: 1: not all Greek names are connected to Troy stories; 2: the founding dates are not given. However, it is a place to start. Troy Towns: these are labyrinths scattered all over Europe and elsewhere. 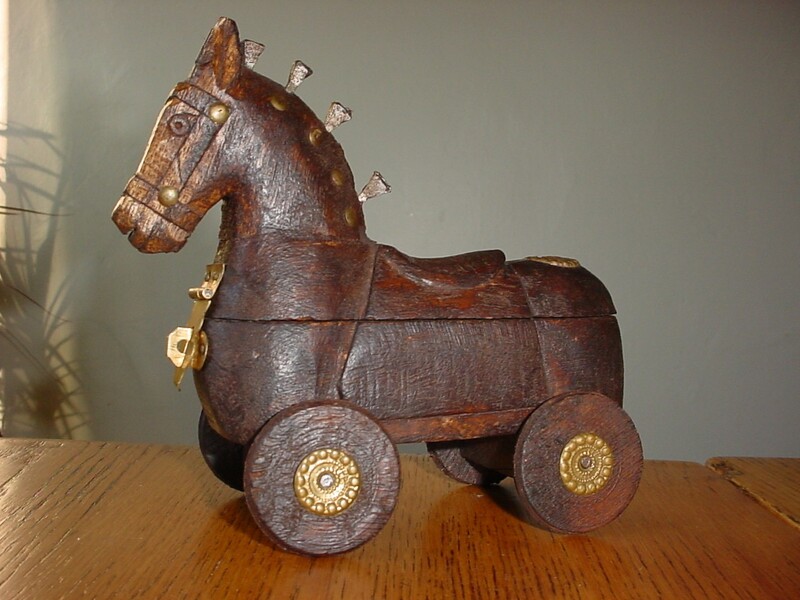 Trojan Horse at the Mt. Olympus Theme Park in Wisconsin: A huge wooden Trojan Horse stands between a roller coaster and a highway. The Baldwin Project: The Story of the Greeks by H. A. Guerber; an out of copyright e-book full of stories from Greek myth aimed at children from 6-9. Many of the stories deal with Troy legends. The print is large and clear and the tone is great for kids. Carol Hurst's Children's Literature Site: This page includes an interesting review of Paul Fleischman's Dateline: Troy, a retelling of the Troy story juxtaposed with modern news collages. She also reviews several other Troy books for children, and makes suggestions for teaching this material. Mythman: Greek Mythology Today and the Myth of the Month. Cute, updated narratives of ancient Greek myths, including a long retelling of the Trojan War with great illustrations (and some silly graphics). Includes "homework help," cartoon figures, etc. Worth a quick look at the Troy material. Tales of Troy: by Andrew Lang. A treasure of beautifully retold Troy stories for children from the 1912 edition. The Trojan War: by Ruth Plumly Thompson. A prose version for young people with some cute illustrations. Achilles at the Gates! : This is a lively interview with Eric Shanower, creator of the wonderful Age of Bronze comics(see below). Age of Bronze: The home page for a series of meticulously researched and beautifully drawn comics about the Trojan War by Eric Shanower. The Animated Trojan War. You Tube video. The Athena Statue: The city of Nashville Tennessee has built a Parthenon and inside it is a huge statue of the goddess Athena, which is currently being gilded. Images and text. Greek Hoplon Construction: How to make a Greek shield. Detailed instructions and illustrations. Trojan War Cartoons and Comics. Ilium by Dan Simmons. A thorough and positive review of the book. Medieval Times: these web pages are actually about a group of restaurants that feature jousting along with supper! Odysseus the Rebel:a comic or graphic novel by Steven Grant and Scott Bieser. Ships' Names from the Classical World: The Lurker's Guide to Bablylon 5. Trojan War Heroes: Where they are today. Humorous updates. Trojan Women: A review of a modernized version by Charles Mee that has the feel of MTV. Troy: An Empire in Siege:104 complex line drawings telling the story of the Trojan War. Troy Story: YouTube cartoon video. Xena and Achilles: Whoosh! online edition, issue 35, August 1999. Long narrative text, but few pictures. Xena, Warrior Princess: a long review of Xena and other characters in the program, as well a response essay about the theology of Xena. The site also includes pictures of the main characters in "Xena." And what does Xena have to do with Troy? She has one adventure involving Helen of Troy, and another involving Ulysses (Odysseus). You Tube on Troy: all sorts of short videos about Trojan themes are linked to this page; as you select one, the list changes to other links that have more to do with the title of the one you select. Fascinating stuff; some good, some terrible. The first ones here are about Achilles. The Mundane Goddess: Uma Thurman plays Hera; a cute 10 minute UTube video.